Edward lived at Block "B" Firth Avenue, New York. [Information kindly provided by Steve Mattocks.] He entered the war in France on the 16th August 1914 with the 4th Field Ambulance. In the early hours of 26th August, the 4th Field Ambulance were ordered to go to Landrecies to treat and evacuate the wounded. A couple of hours after entering the town the Germans arrived, and Edward became one of 219 of the rank and file of the R.A.M.C. to be held captive there. He was taken to Germany entering Sennelager POW camp on 4th September 1914. He was awarded the Meritorious Service Medal in recognition of devotion to duty and valuable services rendered whilst a prisoner of war. 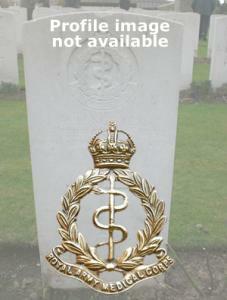 After being repatriated to the UK, he was discharged on the 26th March 1916 "No longer physically fit for war service."